There is so much to love about Edith Wharton. She was a brilliant and prolific writer who captured old New York and sleepy New England better than anyone. She was the first woman to win the Pulitzer Prize in Fiction. She dedicated herself to charity work during World War I, and the gorgeous Massachusetts home she designed and lived in, The Mount, is one of the few National Historic Landmarks dedicated to a woman. (Not to mention one of the most beautiful places you’ll ever see. Think Downton Abbey: Berkshires style.) The forty books she wrote over the course of forty years changed the landscape of literature, design, and what it means to be a female author. I could honestly spend a day raving about the amazingness of Edith Wharton, but today, as we remember her birthday, I’ll concentrate on my favorite novel of hers—one of my favorite novels of all time—1921’s Pulitzer Prize-winning The Age of Innocence. The Age of Innocence tells the story of Newland Archer, a young and wealthy lawyer from one of New York’s “best families,” who is newly engaged to May Welland, the kind of sheltered and properly raised young woman he is expected to marry. Everything is lovely and polite and just as it should be until May’s cousin, Countess Ellen Olenska, flees from an unhappy marriage in Europe (gasp! ), and makes Newland question everything he thought he knew—including who he loves. There are layers upon layers of brilliance in this novel. For starters, no one captures the world of her characters quite like Edith Wharton. Through her wit, dialogue and perfectly drawn people, we are made to feel as though we’ve lived through high society New York in the late 1800s. The customs, the rules, the mustn’ts and the shouldn’ts are made clear from page one. Although the reader—and Wharton, and, over time, Newland—can see how unimportant some of the incredibly important social norms and rules are, it never feels like a farce. It’s real, and it’s history—a perfect snapshot of a very specific time and a very specific set of people in world that was on the verge of extinction. Living through an unhappy marriage herself, Edith Wharton was a master at beautifully rendered, less than blissful love stories. The Newland/May/Ellen triangle is no exception; in fact, it’s her very best. I love a happy ending as much as the next person, but I’m also a complete sucker for unrequited or sacrificial romance—one that may not end with a ride off into the sunset, but that stays with you all the more. It’s been many years since I first read The Age of Innocence, and the mere thought of the final pages is enough to give me chills. It is the perfect conclusion to a perfect novel. I love every bit of it. 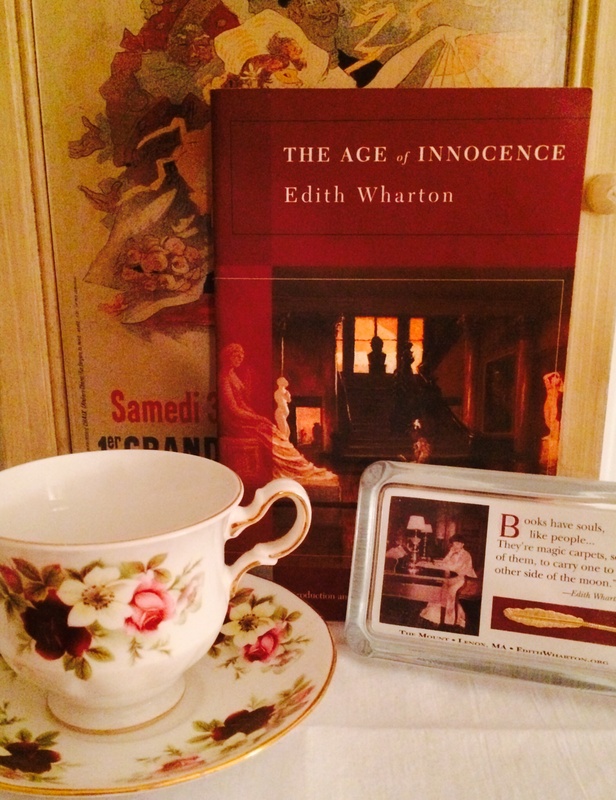 All of Edith Wharton’s novels are worth reading, but to me, there is something so special about The Age of Innocence. I love the story, the characters, the language, and the perfectly depicted world. I love the way that I can always remember the feel the book gave me the first time I read it. I love Edith Wharton for giving that to me, and I love her for sharing her gift with the world. Great review Stephanie! Makes me want to sit in my room and read another classic. You should write book covers!